PRO: Signed with the Riders in February, 2018…selected by the Ottawa Redblacks in the 2013 CFL Expansion Draft…signed by the Riders in May, 2012 as a territorial junior. 2018: Started 18 regular-season games at defensive tackle…registered 15 defensive tackles, one quarterback sack and one forced fumble…added four fumble recoveries for 18 return yards and one touchdown…started the Western Semi-Final…had one defensive tackle. 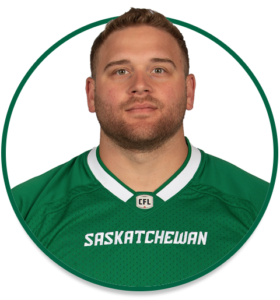 JUNIOR: Played his junior career with the Regina Thunder in the CJFL…was named the league’s Outstanding Defensive Player in 2011 while also being named to the Defensive All-Star Team.